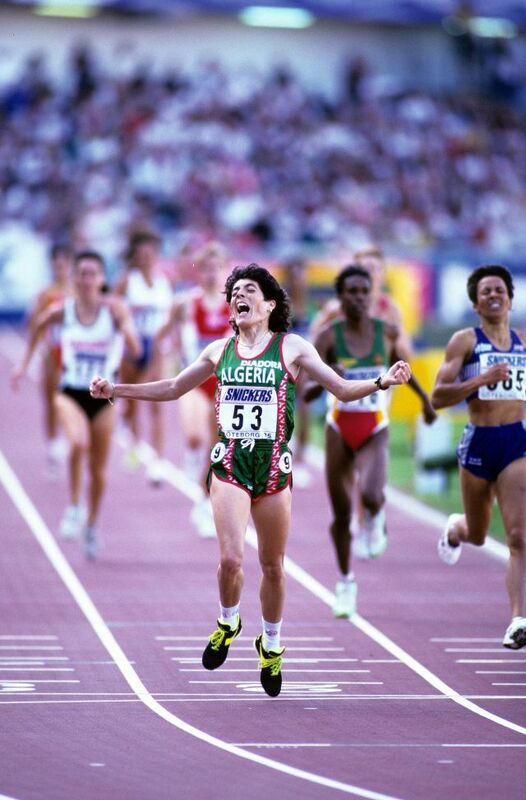 Hassiba Boulmerka was as pugnacious an interviewee as she was a competitor, as I discovered when I went to Algeria in late 1991, to interview her following her victory in the IAAF World Championships earlier that year. Her victory in the Olympic Games in Barcelona six months later made an even bigger impact. This was my piece two days later…………….. When Boulmerka won her world title in Tokyo, the fundamentalist clerics in Algeria denounced her in mosques throughout the country, “for showing her body off to the world,” a criticism consistent with their attempts to ban physical education for young women in schools and universities in Algeria. Hopefully, this second victory will help repulse those attempts more effectively than their own designs to push the country back into the Dark Ages. Sport without politics is about as tenable as gin without tonic. Even as a teetotaller, Boulmerka recognises this implicitly, despite her repeated protests following her victory that, “I am not a politician, I don’t understand anything about politics”. Part of the art of politics is to say the right thing without upsetting the wrong people. She may not have achieved that too successfully in dedicating her victory, “to the memory of Mohamed Boudiaf,”the head of the Algerian Governing Council, who was assassinated by fundamentalists 40 days ago. But, with a parallel dedication, “to the young people of Algeria. I hope this will help them achieve what I’ve done,” coupled with asides like, “all women should be able to practise sport,” her every utterance was a blow to an order whose favourite sport appears to be book-burning. Quite how she achieved her crushing victory is another story. She had not looked like a world-beater in her few races prior to the Games, perhaps due to an injury which had kept her out of competition throughout the early part of the summer. Such a brake can often be a blessing for athletes, who are tempted to race too often. Thus all her energies were evidently, and rightly directed towards winning the biggest prize in the sport. It was surprising, since they looked to be running as a team, that Svetlana Rogacheva chose to lead, and as quickly as she did. For she looked by far the best of the Unified Team trio. And her long stint out front, running the first 800 metres incidentally faster than the men, did not help her when Boulmerka swept past. The Algerian’s coach, Amar Bouras said afterwards that the fast pace suited them perfectly. “If Rogacheva had not led, then Hassiba was prepared to do so. We wanted a fast early pace”. It certainly killed off all the others. And Boulmerka’s last lap sprint did the rest. Her colleague, Noureddine Morceli, also world champion last year, lost his opportunity for Olympic glory in a fashion which left an extremely distasteful impression. Only five days earlier, the Kenyan federation was complaining at great length that Khalid Skah should be stripped of his 10,000 metres gold medal, because a lapped colleague of Skah had impeded Richard Chelimo. But in the men’s 1500 metres, it looked strongly as if the Kenyan trio had ganged up on Morceli, the marginal favourite, despite his own injury problems this year. While Joseph Cheshire led sedately, the tiny Morceli was boxed in the pack by the giant David Kibet. And when Kibet made his move on the last lap, Jonah Birir came from the back of the field to take the relay, and block Morceli anew. But ultimately, none of the Kenyans profited from the tactic, since Fermin Cacho sprinted away to a delirious reception as the first ever Olympic track winner for Spain. Raschid El Basr of Morocco was second, and Mohamed Suleiman of Qatar was third. But the Kenyans won no friends with their transparent blocking tactics. Nike’s attempt to win a bigger share of the shoe and clothing market went awry too. Their pre-Games posters came unstuck in a major fashion. Their three biggest stars, Sergei Bubka, Michael Johnson and Morceli were subjects of a boastful campaign, which looked ridiculous when they were all soundly beaten. In Morceli’s case, it was suggested that we would get to hear the Algerian national anthem for the first time at an Olympic ceremony. Hear it, we did. But it was thanks to Boulmerka, a sentiment that should be echoed not just by the youth of Algeria, to whom she dedicated her victory, but by youngsters everywhere, no matter what their age.